If the name Aidan Ruff rings bells with you, it’s probably because of the frequent mentions he receives on Pete Scargill’s blog and for his designs of their “Hackitt & Bodgitt” series of ESP-based hardware (Aidan’s board designs, such as this ESP12 board aimed at supporting a Nextion display, are especially useful for general purpose ESP8266 development and he makes the files freely available on-line). Aidan is in the process of having an old farmhouse (in an olive grove in Spain) rebuilt and, because there are no mains services (electricity or water) available, has embarked on what, to most of us, would be the non-trivial project of providing enough solar (and possibly wind) power and enough battery capacity to provide summer cooling and winter heating without having to resort to the use of a generator during prolonged, adverse weather conditions. His outline plan on how he intends achieve this (along with some impressive floor-plans) are available on his “Off Grid in Spain” blog. Of more specific interest to ESP aficionados though, is the solar-tracking sub-project he’s put together to ensure that the (MPPT) output from his panels is maximized by adjusting elevation and direction. 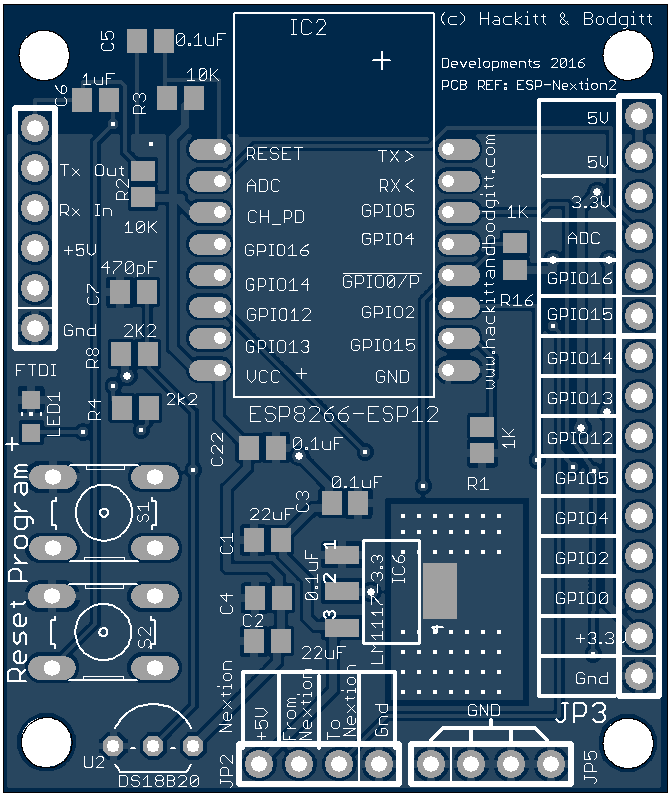 The tracker controller is an ESP8266-ESP12 of course, but with a novel twist. Instead of using the tried-and-tested optical tracking method (with its inherent problem of “hunting” on overcast days), Aidan has hooked up a GPS receiver to the ESP and uses a combination of the precise time and positional data to compute where the sun should be in the sky at his particular location (whether it’s hidden by clouds, or not). The ESP communicates via MQTT (but also has an embedded web server and an attached OLED display panel), which means that, with additional data from a connected weather station, Aidan can add features such as having the solar panels rotate down to lie flat when the wind speed exceeds a pre-set limit. The initial prototyping and testing of the two-axis, linear actuator based tracker is already completed and Aidan has put up his board and mechanical design files and a couple of videos on a Hackaday I/O project page. Unfortunately, at the time of writing, the ESP code doesn’t seem to be available either on that page or from Aidan’s GitHub repository, but despite that, it’s definitely a project worth watching (tracking? ).